Elvis and Jerry Lee Lewis went back a long way. In July 1954 Elvis helped create the sound of rock’n’roll in Sam Phillip’s Sun Studio and Jerry Lee Lewis also found himself outside the door of Sun Records, 2 years later, in November 1956. By this time Elvis was well-established on the RCA label and Sam Phillips was on the lookout for new stars. Spotting Jerry Lee Lewis’ devil-driven passion for music, Phillips went on to make him into Sun's biggest seller with songs like "Whole Lotta Shakin' Goin' On" & "Great Balls Of Fire". 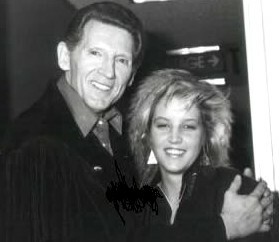 Jerry Lee Lewis, like Elvis, was brought up singing the Christian gospel music of the southern Pentecostal churches. 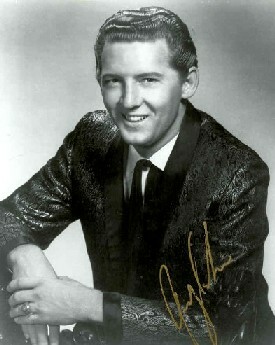 From a very early age Jerry Lee would play the piano in church, but by the age of 15 he had been expelled from the Southwestern Bible Institute in Texas for misconduct, which included playing rock'n'roll versions of hymns in church! On December 4, 1956 as a Carl Perkins recording session at Sun was finishing, Elvis dropped by to see his old friends. Jerry Lee Lewis just happened to be playing piano on the session that day. Elvis and the group started singing and playing together, and Phillips was smart enough to switch on the tape-recorder. Phillips also called Memphis journalist Robert Johnson, telling him to rush to the studio for a good story & photo opportunity. Phillips also called Johnny Cash to get him in for the photo-shoot, although he did not actually perform with the group. 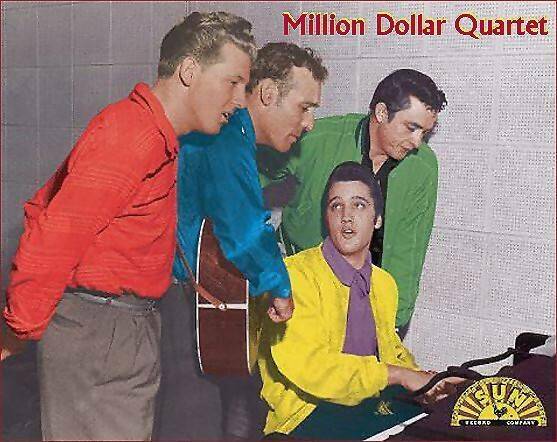 The jam session later became known as the “Million Dollar Quartet” session. Twenty years later, in November 1976, Jerry Lee Lewis and Elvis' encounter would be a very different affair! According to Harold Loyd, first cousin to Elvis, and the presiding guard on duty at Presley's Graceland mansion -- in the early hours of November 22, 1976, he was greeted by an unexpected visitor. Jerry Lee Lewis, accompanied by his wife, pulled up to the mansion's front gate in his new Rolls-Royce Silver Shadow. He asked Loyd if he could see Elvis, but was told that the King was asleep. Lewis politely thanked Loyd and drove away without incident. Later that morning, at 9:30 a.m., Lewis flipped his Rolls while rounding the corner at Peterson Lake and Powell Road in Collierville. The police report on the incident stated that the Breathanalyser test yielded negligible results, but that Lewis was obviously tanked on something and that he was charged with driving while intoxicated, reckless driving, and driving without a license. Kirkpatrick and four other officers took Lewis away immediately. But Loyd would receive another visitor before night's end. He explains, "When the wrecker came down and towed Jerry's car away [at approximately 4 a.m.] they hadn't much more than gotten outta sight when another car comes flyin' up the driveway and two guys got out. I recognized one of 'em as Jerry Lee's dad. However Linda Gail (Jerry Lee's youngest sibling) interpretation of November 23rd reads quite a bit differently. 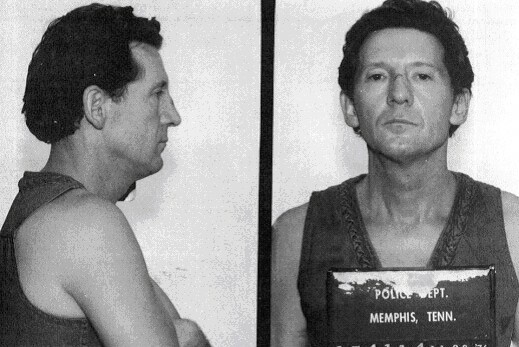 "Jerry Lee admitted to me that he had been partyin' and drinkin' and that he was a little bit out of it," Gail recalls, "but he swore his intentions were good. He's very misunderstood, you see. It's a shame really." 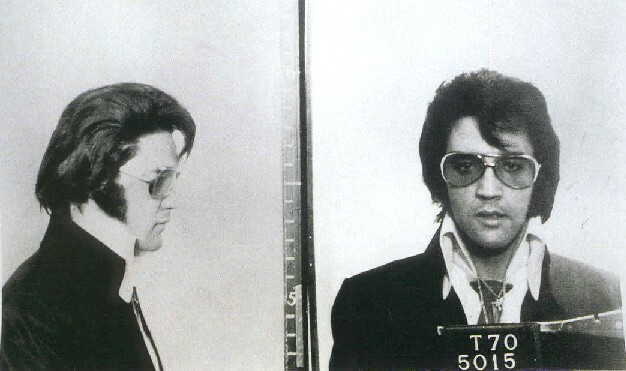 Note - Elvis “mug-shot” from 1970 when he was presented with an honorary police badge. I‘ve always felt Elvis was kept away from things he should of known and Jerry Lee was always misunderstood or his worst enemy. The things Elvis should of done in his’ movie years and the things "the killer" is attempting now, should have been done in his’ prime, instead Elvis was lead the wrong direction & Jerry Lee drank his best years away. I still enjoy all their music today and isn’t that what it’s all about, when you get right down to it? Dennis Hauser – March 2010.